I love the definition that includes “building a lemonade stand” which perfectly defines an actionable insight. Knowledge and Wisdom are both important but neither one (on their own) implied specific action. Actionable insights truly represent our end-game, and reaching that outcome truly illustrates the emphasis on reaching it efficiently and effectively measured by a new metric I’ll toss out – Speed-to-Insight. True performance insights imply action based upon Wisdom…gained from Knowledge…curated from bulk information…and accessed from reliable information sources. This means Critical Thinking and Informed Decision-making are what yields Actionable Performance Insights – the SIGNAL – that prompts a call-to-action. In this example, launching a construction project to build a lemonade stand. What Is the Optimal SIGNAL-to-NOISE Ratio with Our Curation Efforts? We spend most of our time operating in the acquisition of important information and then curating and disseminating in bulk. 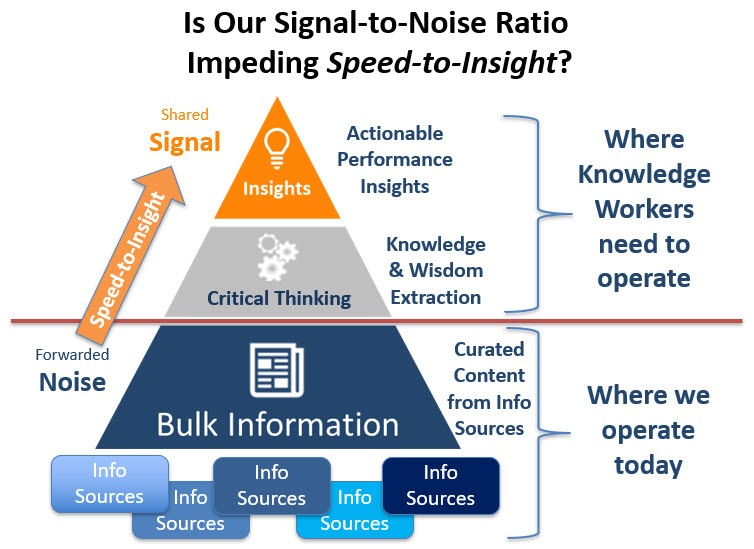 As far as an optimal signal-to-noise ratio goes, I’m not sure there really is a known ratio for this one, especially when comparing the volume of bulk information to the critical nuggets of actionable insights that remain buried within. I’ve seen numbers as low as 2% embedded knowledge in bulk information but cannot substantiate. Safe to say, the number is low…and the level of effort to extract is high…and repeated every time bulk information is forwarded again during the rinse and repeat cycle we’ve all mastered. For the most part, forwarding bulk information is where many of us work today…and for a number of justifiable reasons. In a previous life, I had a curation role and was quite proficient finding and forwarding bulk information to a design team. Critical-thinking eventually happens…but not until the receivers of that bulk information invest time sifting through the NOISE to get to the SIGNAL. And even then, who’s to say the valuable insight that tripped the originator’s trigger is going to trip the receiver’s…and prompt the intended meaningful action? What excuse do you use when you discover a half dozen 15-to-20-minute reads in queue in your inbox? My personal favorite is, “I’m not sure I have time!”; hence, my “to read later” folder gets a direct deposit, or maybe I make a quick un-informed but well-intended, click of a “SHARE” button just in case the attachment really is worth reading…by someone else. Hey, don’t condemn me…we’ve all done it. Let’s say we do take the time to read. Then what? We deem it as worthy of others to read…forward it with best intentions…enabling them to perpetuate the rinse and repeat cycle. It’s not our intention but we default to forwarding NOISE as bulk information instead enabling seamless, frictionless and ubiquitous access to SIGNALS conveying actionable performance insights. What happens to our individual insights after they’ve been extracted? Do we save them? Do we remember where we saved them? Are they ever found again? Are they ever shared? Are they ever read? Ever applied? Are they targeted to relevant coworkers or just blasted out into the ether? Are we tracking what’s shared? Are we able to link insight utilization to performance? Are we embedding insights into formal learning programs? Are we training people how to extract, tag, and share insights? The answers to the questions above are likely to be “No!” or “Not possible today!” Those answers do not cast dispersions on current curation practices or best intentions by anyone. Positive answers to these questions require a viable technology ,and if none exists, adopting Curation 2.0 is unlikely. We curate information daily, and bulk information is the result…and there is no question that this information is essential – BUT – it’s just not enough. I’ve written for a few years now about “Training” being essential – but not enough by itself – thus, the need to move to Point-of-Work Assessments for building sustainable learning performance solutions. Is it any different when we consider the tsunami of bulk information we send across the enterprise? There is no way the LMS can serve up performance insights like the LMS serves up course options. Surely, it’s important that we continue to share curated bulk information, but it’s simply not optimized for Point-of-Work…especially considering critical-thinking is also represented at Point-of-Work in associated decision-making workflows. The solution calls for integration of an Insight Curation Engine – ICE, a new cloud-based technology that enables critical-thinking support at the moment of need via – Performance Insights. ICE produces Performance Insights, like a performance support system produces Performance Support. The similarity ends there however, because Performance Support is largely targeting tactical, actionable information like “How To” for process-centric, task-level, instructional support. ICE and Performance Insights tend to be more strategic in nature where the “process” is something more cerebral – Critical-Thinking – answering the “Why” essential to formation of actionable insights and informed decision-making. Referencing Figure 1 again, the digital transition to Curation 2.0 and integration of an Insight Curation Engine facilitates a move above, if not eliminates, the red line. ICE integration accelerates curation productivity by extracting performance insights from bulk information on the front-end enabling critical-thinking sooner than later. Pluck the Signal from the Noise before forwarding anything. Forward curated actionable insights wrapped around curated bulk information to enable quick assessment of taking acting…or reading further…and even adding our own insights. Enable targeted sharing of insights with other individuals, project team members or possible the entire enterprise. We reduce unproductive time and delay in critical-thinking necessary to make informed decisions. Track user engagement in insight sharing with utilization data. Align utilization analytic to align with performance impact. Never lose track of your insights by using an integrated and sharable Digital Brain. Eliminate engagement with scarce IT resources since ICE is cloud-based. Sharing actionable insights to relevant individuals, groups, audiences, and/or teams promotes the force multiplier we miss by continuing our current curation practices of perpetuating the act of “bulk information-forwarding” as opposed to more efficient and effective “actionable Performance Insight forwarding”. Point-of-Work is still ground zero and must be assessed as such, but not every ground zero is tactical in terms of moments of need. We cannot overlook strategic moments of need where critical-thinking is required to inform decisions that launch value-add initiatives… like… say… construction of lemonade stands. Thanks for reading, and as always, I welcome and value your thoughts and comments! ← CONTENT CURATION: Are We After Knowledge, Wisdom or Insights? This is right on target Gary – it is a very unusual circumstance where people- including me – will read through a lot of content to glean the actionable 2% of information it/they contain. Having insights available in the flow of work is not only a best practice idea, but is achievable with today’s technology! Dear Gary – great stuff. I am working on similar thoughts/challenges. I simply use a slightly different wording and focus on what I call the “filters” to move from Data to Action. However, I explicitly emphasize that there is currently no established framework / wording to address the challenges that you have highlighted. I believe we need to be driven by the decision-making needs, the subsequent questions that we need to get answered (to make a specific decision), then the fameworks that exist (or need to be developed) to answer the questions and finally we then best understand what kind of intelligence (data, information, knowledge) you need to “fill” each dimension of your frameworks. Hope this makes sense to you as well.